Not to be confused with Alaouite dynasty. For the boxer, activist and philanthropist, see Muhammad Ali. The Muhammad Ali dynasty was the ruling dynasty of Egypt and Sudan from the 19th to the mid-20th century. It is named after its progenitor, Muhammad Ali Pasha, regarded as the founder of modern Egypt. It was also more formally known as the Alawiyya dynasty (Arabic: الأسرة العلوية‎ al-Usra al-'Alawiyya). Because a majority of the rulers from this dynasty bore the title Khedive, it was often referred to by contemporaries as the 'Khedival dynasty'. Muhammad Ali was a commander in the Ottoman army that was sent to drive Napoleon's forces out of Egypt, but upon the French withdrawal, seized power himself and forced the Ottoman Sultan Mahmud II to recognize him as Wāli, or Governor of Egypt in 1805. He traced his ancestry back to Ibrahim Aga, from Korca, Albania, who had moved to Kavala. Demonstrating his grander ambitions, he took the title of Khedive; however, this was not sanctioned by the Sublime Porte. I am well aware that the [Ottoman] Empire is heading by the day toward destruction. ... On her ruins I will build a vast kingdom ... up to the Euphrates and the Tigris. At the height of his power, Muhammad Ali and his son Ibrahim Pasha's military strength did indeed threaten the very existence of the Ottoman Empire as he sought to supplant the Osman Dynasty with his own. Ultimately, the intervention of the Great Powers prevented Egyptian forces from marching on Constantinople, and henceforth, his dynasty's rule would be limited to Africa, and Sinai. Muhammad Ali had conquered Sudan in the first half of his reign and Egyptian control would be consolidated and expanded under his successors, most notably Ibrahim Pasha's son Isma'il I. 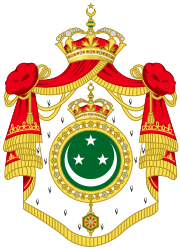 Though Muhammad Ali and his descendants used the title of Khedive (Viceroy) in preference to the lesser Wāli, this was not recognized by the Porte until 1867 when Sultan Abdul-Aziz officially sanctioned its use by Isma'il Pasha and his successors. In contrast to his grandfather's policy of war against the Porte, Isma'il sought to strengthen the position of Egypt and Sudan and his dynasty using less confrontational means, and through a mixture of flattery and bribery, Isma'il secured official Ottoman recognition of Egypt and Sudan's virtual independence. This freedom was severely undermined in 1879 when the Sultan colluded with the Great Powers to depose Isma'il in favor of his son Tewfik. Three years later, Egypt and Sudan's freedom became little more than symbolic when the United Kingdom invaded and occupied the country, ostensibly to support Khedive Tewfik against his opponents in Ahmed Orabi's nationalist government. While the Khedive would continue to rule over Egypt and Sudan in name, in reality, ultimate power resided with the British High Commissioner. In defiance of the Egyptians, the British proclaimed Sudan to be an Anglo-Egyptian Condominium, a territory under joint British and Egyptian rule rather than an integral part of Egypt. This was continually rejected by Egyptians, both in government and in the public at large, who insisted on the "unity of the Nile Valley", and would remain an issue of controversy and enmity between Egypt and Britain until Sudan's independence in 1956. In 1914, Khedive Abbas II sided with the Ottoman Empire which had joined the Central Powers in the World War I, and was promptly deposed by the British in favor of his uncle Hussein Kamel. 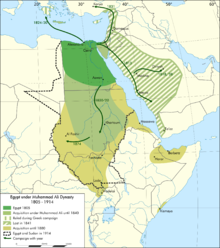 The legal fiction of Ottoman sovereignty over Egypt and Sudan, which had for all intents and purposes ended in 1805, was officially terminated, Hussein Kamel was declared Sultan of Egypt and Sudan, and the country became a British Protectorate. With nationalist sentiment rising, as evidenced by the revolution of 1919, Britain formally recognized Egyptian independence in 1922, and Hussein Kamel's successor, Sultan Fuad I, substituted the title of King for Sultan. However, British occupation and interference in Egyptian and Sudanese affairs persisted. Of particular concern to Egypt was Britain's continual efforts to divest Egypt of all control in Sudan. 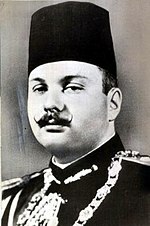 To both the King and the nationalist movement, this was intolerable, and the Egyptian Government made a point of stressing that Fuad and his son King Farouk I were "King of Egypt and Sudan". The reign of Farouk was characterized by ever increasing nationalist discontent over the British occupation, royal corruption and incompetence, and the disastrous 1948 Arab–Israeli War. All these factors served to terminally undermine Farouk's position and paved the way for the revolution of 1952. Farouk was forced to abdicate in favor of his infant son Ahmed-Fuad who became King Fuad II, while administration of the country passed to the Free Officers Movement under Muhammad Naguib and Gamal Abdel Nasser. The infant king's reign lasted less than a year and on June 18, 1953, the revolutionaries abolished the monarchy and declared Egypt a republic, ending a century and a half of the Muhammad Ali Dynasty's rule. Hassan, H. (2000). In the House of Muhammad Ali: A Family Album, 1805–1952. American University in Cairo Press. ISBN 978-977-424-554-1. OCLC 45016821. ^ Baten, Jörg (2016). A History of the Global Economy. From 1500 to the Present. Cambridge University Press. p. 217. ISBN 9781107507180. "The Royal House of Mehmet Ali". Archived from the original on 2007-10-24. Retrieved 2008-08-19. "Family tree of the House of Mohammed Aly". Archived from the original on 2008-05-16. Retrieved 2008-08-19. "The Royal Order of the Crown of Egypt" (in German). Archived from the original on August 20, 2008. Retrieved 2008-08-19.